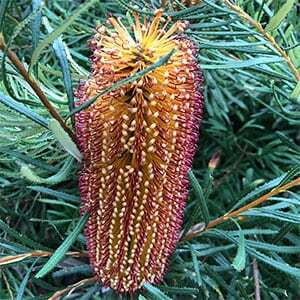 Banksia spinulosa is a hardy species growing to approx 2m. It is frost tolerant, grows well in coastal conditions and has very attractive flowers. The natural habit is a somewhat sprawling shrub, it is the named varieties that are best suited to garden use as they are generally more compact with better flowers. Characterised by long narrow foliage which is attractive through the year, it is the flowers that appear from autumn through winter that are the main attraction to gardeners and birds alike. Large cylindrical flower spikes usually in tones of orange to red. In some cultivars these can reach 15cm in length, often smaller. Best grown in a sunny position in a well drained soil, the new cultivars require very little care however tip pruning to maintain a bushy habit is recommended. Only use a specially formulated low phosphorus native plant fertilizer. Usually very little fertilizer is required. Yellow foliage is an indication that some may be needed. Mulch around the plant to maintain a cool root run and water deeply every few weeks through the first summer. The lower growing varieties make excellent potted specimens in a sunny position. The pot will lift the plant making the flowers more prominent as they appear. Native to Victoria, New South Wales and through Queensland this low growing species is found for sale as named cultivars such as Banksia ‘Birthday Candles’, ‘Stumpy Cushion’, ‘Honey Pots’ and ‘Coastal gold’. 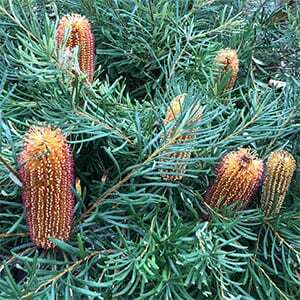 Banksia spinulosa ‘Honey Pots’is a dwarf or low growing cultivar well worth a place in the garden, also suited to growing in containers. Also found as Banksia spinulosa var. neoanglica and var. collina. The species can be propagated from cuttings or grown from seed. Soil – Humus rich, well drained, will grow in sandy soils. Spread To around 1 – 1.5 metres. Flowers – Cone shaped and orange to red. Drought tolerant -Yes once established.